Few hours later, when she awakened in the hybernation unit, she found that he is at the Detention Megaship. Luckily, she had enough money to pay the insurance, and the local office of the insurance company already have sent her new ship. She went first to local security office where have paid off the fine for station attack, and then headed into docks to check her "new" ship. Quick controll revealed that all systems are the same like before, they all seemed are working very well, but Karina still felt deep sorrow for the loss of the original Beetle. "I realy do want to avoid repeating of this experience", she thought. Latest affairs forced her to think more serious about finances; it seemed now obvious that possibility to lose a ship is not something what could not happen. She was back at normal station and were checking the list of missions ... and then she noticed it: it was an generously paid mission asking surgical strike against skimmers (on planet surface) of another faction. What was the most interesting on this type of mission was the fact, that it needed use of small surface vehicle (SRV). 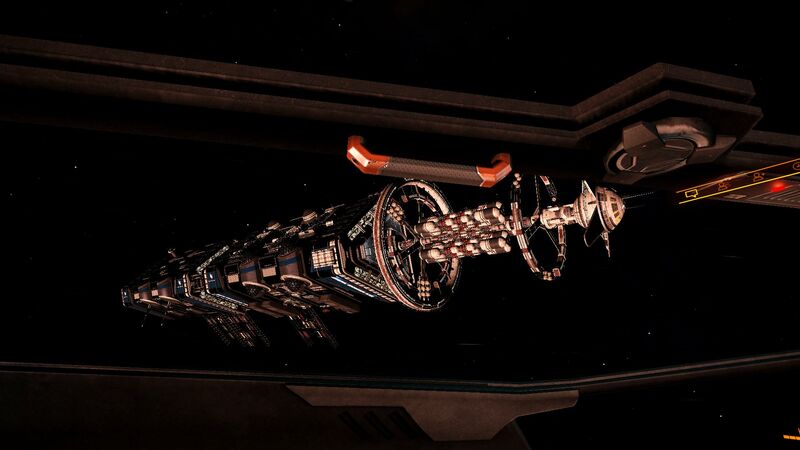 Ship used for transporting SRV was practically irrelevant if the pilot was careful enough and did not bring danger to the location where the ship landed. What was even more interesting was that there were more factions asking for attack on the same skimmers, was about time to check how it works in real. Multiple surface missions against skimmers were finished and Karina had enough occassions to improve her driving skills with the SRV (her finances have rised up also nicely). She learned the differences between sound and graphic patterns showed on SRV radar; and this new skill resulted in collecting of different micro-materials which can be for example used fo refuel, repair or rearm of the SRV. 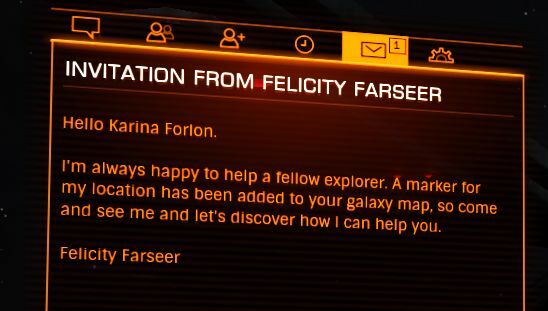 There was also one hidden bonus, which was revealed when Karina received personal message from Pilots Federation. They informed her that she had reached the rank Scout (Exploration). And then came one another surprise, it was personal invite to visit Felicity Farseer. Karina did not know for sure who Felicity is, but she heard already some rumors about persons called "The Engineers". "It may be worth to visit her soon", thought Karina, but there was something else, what she want to do earlier ... her assets rised up enough to allow her think about new better ship. is any of this in the crossfire mod or is this just a very good story? Tnis is another game (Elite Dangerous) and it is all from game. i have elite dangerous but i have not played it yet. ... you have here enough experience also with this game, is for you to decide if want try it or not. i did try it but i was having a lot of trouble docking so i decided to let it rest for awhile until i get my mind set on really trying it out.